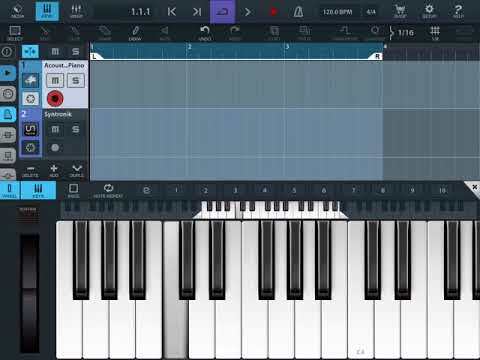 IK Multimedia’s Syntronik iOS Audio Unit Extension Bug? I’m using Syntronik on iPad Mini 4 and iPhone 7 Plus (both on latest iOS). iConnectAudio4+ is being used as an audio interface (48,000kHz/16bit). Another app sends MIDI to the AUM Destination port and into the AU of Syntronik. Syntronik in stand-alone mode produces notes just fine. But...When in AU mode via either AUDIOBUS 3 or AUM it plays back at a pitch either a 1/2 or full tone higher than the actual pitch. I need to use Syntronik as an AU so this really blows. Rate is locked at 48,000kHz and even the MIDI transpose button in AUM produces sketchy results. How do I fix this? I’m not sure if it’s IK, Apple, iConnectivity, AB3 or AUM’s problem...or maybe just my own problem all other AUs work properly. Ok, allowing 48KHz then transposing by -1 semitone on the MIDI options in AUM brings it back into unison pitchwise. Thanks for the help. I recently reported this bug to IK Multimedia. They acknowledged the problem and said the development team was working on it for the next update. That’s good news. I hope they fix it soon! No. This is the iOS version. But, I have used the desktop version and it’s much better i.e. more tweakable. The video perfectly demonstrates the issue. MG2 forcing 48kHz in AUM is another problem that I’ve reported too - desktop version has no such problemo. I haven’t used Cubasis 2. Yes, they immediately recognized the issue. Hopefully it will be fixed soon. Our Development Team is aware of the Sample Rate issue in regards to Syntronik as an AU Unit. They are working to fix this issue upon the next update. In the meantime, if you restart the app with a higher Sample Rate, Syntronik should work fine. And honestly how often does one really need to change the sample-rate 'mid session'? This might be tricky bug to fix since it would most likely require some for of user interaction? (ie. bring up the AUv3 UI so the plug-in can re-negotiate the sample-rate). We did just want to reach out here directly and keep you guys filled in. We can confirm this behavior has been reported to our development team and should be resolved in an upcoming update. Be sure to keep an eye out for this update in the Apple App Store. We apologize for the inconvenience and in the meantime please feel free to try the workaround listed above. Thank you @Ryan_IK for your support. I’ve been using Syntronik (I bought the full IAP) for a while and really love it, specially the effects plugins module that have no rival in IOS. I encountered the sample rate problem when tried to use Syntronik loaded in AUM on my iPhone, which is fixed at 48KHz and cannot be changed when used with earphones only. Hope to get the updated version soon. Thanks for piping in with the hopeful news. I look forward to the update. 1. Restarting the AUv3 host has had no effect so far. 2. There seems to be a bug when reporting a tech issue on the IK site. I tried to do a report from my iPhone and got a blank screen after the 'Send' button was clicked. Same on a desktop computer. Just mentioning it here as I couldn't get communication going via the IK site. any news on this upcoming fixing ? Any ETA ? It's IKMM...so don't hold your breath. @Ryan_IK @ikmultimedia has this issue been fixed? I suspect I am having problems with the Syntronik AU because of this. The audio is playing 1 semitone lower, and Syntronik - my otherwise go-to synth app on ios, has been unusable for a long time now. Just bumping this up in hopes that @Ryan_IK and @ikmultimedia can give an indication on the status of this bug fix. I can also confirm that this is specifically an AUV3 issue as IAA is working fine. I'm mildly persistent on this because I have a ton of BM3/Cubasis projects relying on Syntronik AU. I really hope there's going to be a fix soon 🙏. Thanks for everyones patience while I got back. We can confirm this behavior has been reported to our development team and should be resolved in an upcoming update. Be sure to keep an eye out for this update in the Apple App Store. We apologize for the inconvenience and in the meantime please feel free to try the workaround listed above. It's getting onto a year and this is still an unresolved issue. On the back of the Sampletank 4 shemozzle, I'm officially washing my hands of these clowns who call themselves 'IK Multimedia'. You will never see another cent from this musician. Get your act(s) together! You oughtta be collectively ashamed of yourselves. A curt cut and paste of a 7 month old post from the same thread might give the impression that you have no respect for your customers and just can’t be assed to make an effort. Is that the impression you wanted to convey? You usually do better than that. @Ryan_IK @ikmultimedia - any updates on this issue? I'd be so happy to ditch my -1.467 semitone workaround! thanks. @Vaultnaemsae We are sorry to hear of your overall experience and that you no longer wish to use our products. We hope you do change your mind on the topic and if there is anyway we can help directly with any other issues please let us know. I am available here via PM. This particular behavior's cause in Syntronik iOS was identified by the team, so we should be seeing something shortly. I don't have a concrete information on a release. Be sure to keep an eye out for the next update. Hopefully this helps change your mind here. OT Please do note, we have recently updated SampleTank 4 with some great improvements. If you haven't snagged the update, make sure to do so now. Shoot me a PM if you need any help getting the update. @TheOriginalPaulB Our team has been working diligently to figure out this issue, while also covering some other great stuff, which I think everyone here will be interested to see. Make sure to stay tuned to our news letter to be the first to hear of our upcoming development. @gosnote Yes, we have identified the issue and we are doing out best to get this update out soon. Stay tuned for more info. @hansjbs Sorry to hear of your experience here. We do hear you and we are working on getting this update out asap. Thanks again for your interest in Syntronik. Funny, that’s as about as many words as I’ve heard from IK in months for any of my tickets/requests - albeit meaningless words.